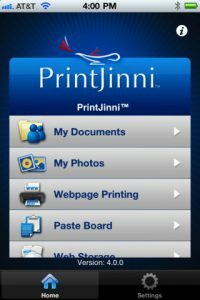 PrintJinni, developed by Thinxtream Technologies Pty. 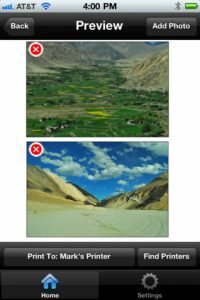 Ltd., is a good-looking iPhone app that delivers on its promise to make mobile printing painless and stress-free. A few caveats: PrintJinni does have some limitations. To print, you must be able to connect to printers/MFP which is PostScript® 3/PCL 5®/PCL 6® compatible, and SNMP-enabled with Wi-Fi support or accessible on a Wi-Fi network. Or, there’s another option. While there’s no compatibility for Linux boxes as of yet, you can print from installed on a Microsoft Windows® PC or an Apple® Mac® computer that is accessible on a Wi-Fi Network. The printing jobs we tested looked great, and the whole process was surprisingly easy. But one of the downsides of PrintJinni is that it isn’t truly free. You do need to sign up for an account before you can get going. 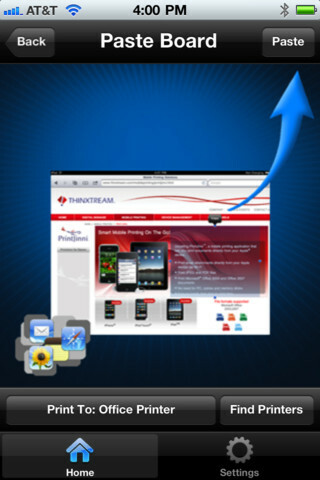 But despite PrintJinni’s pay-to-play features, the interface is great and the iPhone app is reliable. 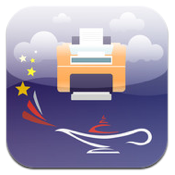 If you constantly need to print documents on the go, this app is perfect for students and busy professionals. Just remember that you’ll have to keep paying every year to renew your subscription. PrintJinni is compatible with iPhone, iPod touch, and iPad. Requires iOS 3.2 or later.